1 Gen. Dict. Biog. Brit. 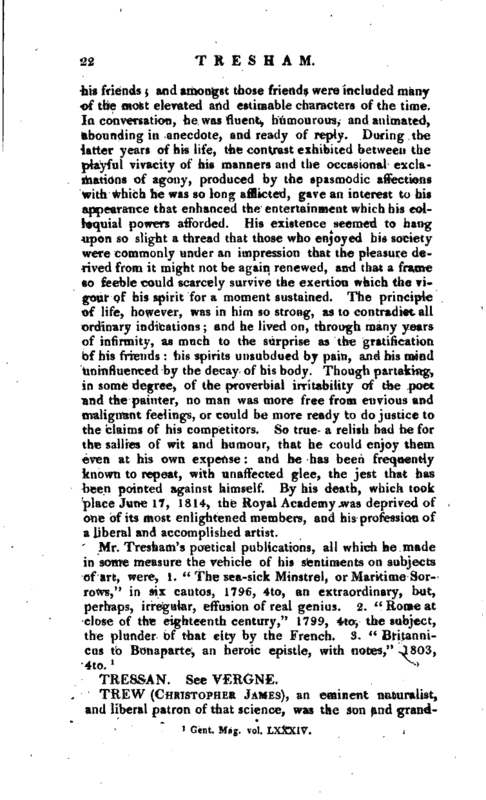 Supplement Toulmin’s Hit of Taunton, p. 81. iiec our account of Thomas Gordon. | well as the artist, and held as an authority, from which few would venture lightly to dissent. This kind of knowledge proved not a little beneficial to him. Some years since, Mr. Thomas Hope, whose choice collections of every kind are well known, had given to one of his servants a number of Etruscan vases, as the refuse of a quantity which he had purchased. Accident made Mr. Tresham acquainted with the circumstance; and the whole lot was bought by him of the new owner for \00l. It was not long before he recefved 800l. from Mr. Samuel Rogers, for one moiety; and the other, increased by subsequent acquisitions, he transferred a few years ago to the earl of Carlisle. That nobleman, with a munificence and liberality which have invariably marked all his transactions, settled on the artist an annuity of 300l. for life, as the price of this collection. With such honour was this engagement fulfilled, that the amount of the last quarter, though due only a few days before Mr. Tresham’s death, was found to have been punctually paid. When Messrs. Longman and Co. commenced their splendid publication of engravings from the works of the ancient masters, in the collections of the British nobility, and others who have distinguished themselves by their patronage of the fine arts, they, with a discernment which does them credit, deputed Mr. Tresham to superintend the undertaking. To the honour of the owners of those master-pieces it must be recorded, that every facility was afforded to this artist, not only in the loan of pictures, but in the communication of such facts relating to the respective works as they were able to furnish. The salary paid him by these spirited publishers, contributed materially to the comfort of his declining years. 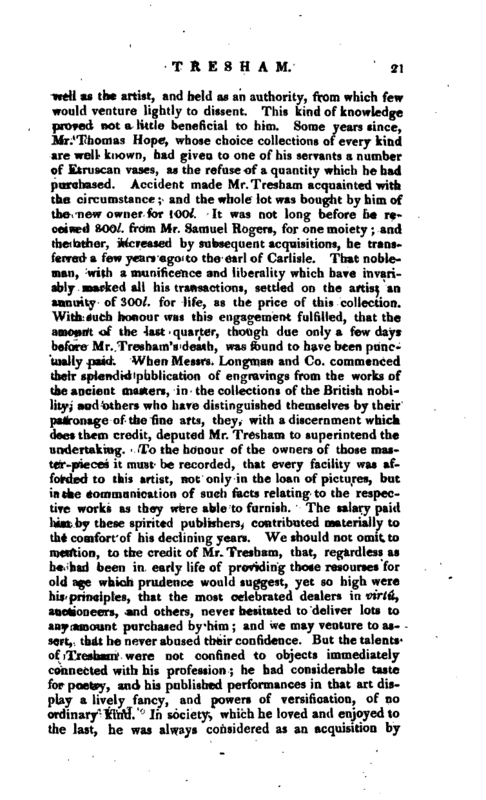 We should not omit to mention, to the credit of Mr. Tresham, that, regardless as he had been in early life of providing those resourses for old age which prudence would suggest, yet so high were his principles, that the most celebrated dealers in virtu, auctioneers, and others, never hesitated to deliver lots to any amount purchased by him; and we may venture to assert, that he never abused their confidence. 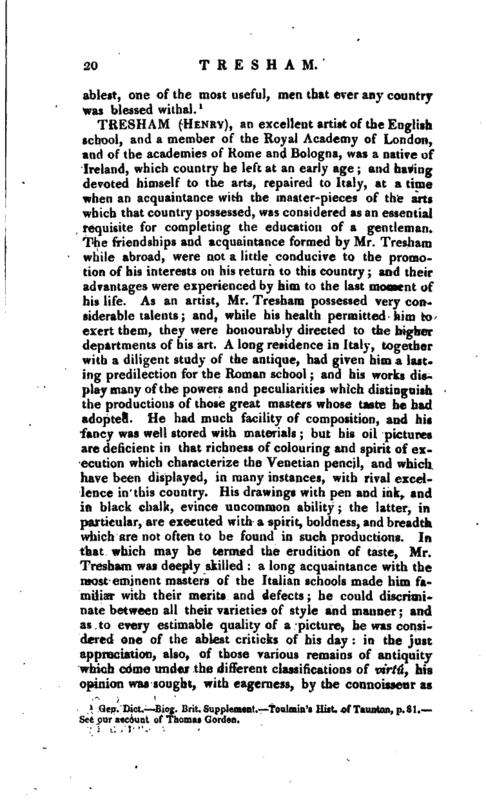 But the talents of Tresham were not confined to objects immediately connected with his profession; he had considerable taste for poetry, and his published performances in that art display a lively fancy, and powers of versification, of no ordinary kind. In society, which he loved and enjoyed to the last, he was always considered as an acquisition by | his friends; and amongst those friends were included many of the most elevated and estimable characters of the time. In conversation, he was fluent, humourous, and animated, abounding in anecdote, and ready of reply. During the latter years of his life, the contrast exhibited between the playful vivacity of his manners and the occasional exclamations of agony, produced by the spasmodic affections with which he was so long afflicted, gave an interest to his appearance that enhanced the entertainment which his colloquial powers afforded. His existence seemed to hang upon so slight a thread that those who enjoyed his society were commonly under an impression that the pleasure derived from it might not be again renewed, and that a frame so feeble could scarcely survive the exertion which the vigour of his spirit for a moment sustained. The principle of life, however, was in him so strong, as to contradict all ordinary indications; and he lived on, through many years of infirmity, as much to the surprise as the gratification of his friends: his spirits unsubdued by pain, and his mind uninfluenced by the decay of his body. Though partaking, in some degree, of the proverbial irritability of the poet and the painter, no man was more free from envious and malignant feelings, or could be more ready to do justice to the claims of his competitors. So true a relish had he for the sallies of wit -and humour, that he could enjoy them even at his own expense: and he has been frequently known to repeat, with unaffected glee, the jest that has been pointed against himself. By his death, which took place June 17, 1814, the Royal Academy was deprived of one of its most enlightened members, and his profession of a liberal and accomplished artist.